Kevin Roche. Photo: Ford Foundation. IF THE CONTEMPORARY ARTIST ASPIRES to channel the spirit of the modern world, the modern architect is in the business of, also, shaping that world. Kevin Roche succeeded at this more than most. Aligning himself with some of the most powerful systems of the twentieth century, Roche remade city blocks and skylines from Columbus to Kuala Lumpur. 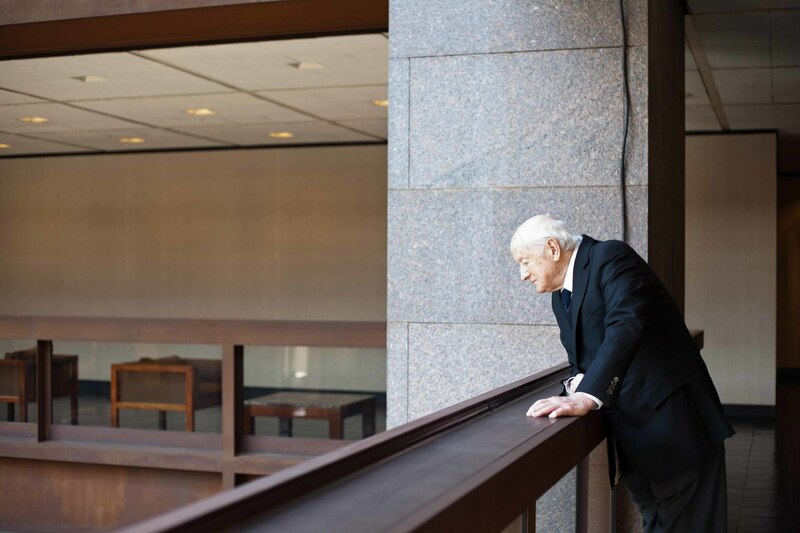 His firm, Kevin Roche John Dinkeloo and Associates, completed projects for the computing industry (IBM), advertising firms (Leo Burnett), chemical companies (Union Carbide), big pharma (Merck and Company), petroleum giants (Conoco), and banks (Deutsche Bank). Roche’s cultural commissions—performing arts centers, research facilities, foundations, and museums—were often funded by the same interests. While Roche’s oeuvre was defined by corporate power, he frequently used architecture to let us glimpse inside this sequestered realm. Many of his privately owned buildings include quasi-public spaces: gardens or atria, often massive in scale. These are the sites by which I know Roche. I am thinking of the disorienting experience of emerging from the 2/3 train into 60 Wall Street (originally JP Morgan’s headquarters) and its mirrored and marbled columns, or of turning from Forty-Third Street into the terraced interior garden of the Ford Foundation, suspended like a giant terrarium between beams of Cor-Ten steel. These are spaces of artifice, meant to evoke the nonmodern or the nonarchitectural, ancient temples or tranquil forests. Roche specialized in these worlds within worlds, which have an air of dreams, of entering a portal that leads not to the outside but to its simulation. Theatricality also defines his privately funded public spaces, such as the Sackler, Rockefeller, and other wings of the Metropolitan Museum of Art. The Temple of Dendur is no longer monumental itself, but a set piece framed by slabs of water, glass, and stone. Roche’s design process deferred to the forces that exert influence over a site and a program. He described his buildings as the accumulated outcome of urban infrastructure, natural systems, human behavior, and social patterns. I relate to this way of working, understanding an artistic object as product and actor within human and natural systems. In New York, Roche joined forces with the changing powers of the city: the rise of finance capital and art entertainment. He had a hand in the NYU-ification of downtown, building a ten-story student center on Washington Square and reconfiguring Arata Isozaki’s exuberant Palladium nightclub into a dorm. Roche was an architect of his times in two senses: He was both a product and a producer of the era. As an artist engaged with modes of systems thinking that undergird modern life, I find in Roche’s work both inspiration and a warning. An art of systems always risks being subsumed by the system itself. Michael Wang is an artist based in New York.